Bitterns are part of the Ardeidae family, this being a family which also includes herons and egrets. Within the Ardeidae family, all members of the Botaurus and Ixobrychus genera are called bitterns. These genera are fairly separable, to the rest of the Ardeidae family, more perhaps on account of their partly nocturnal habits and correspondingly-adapted coloration, than on strictly structural grounds, though some differences of proportion are observable, bitterns having generally shorter necks than other members of the Ardeidae family. One particular species, The Great Bittern is the Botaurus stellaris of ornithology, also known as the European Bittern. It is fond of areas where reeds grow, and was formerly an abundant bird in many parts of the UK. However since the reclamation of the bogs and fens it used to inhabit, it has become only an irregular visitor, although each winter it does appear in some numbers, when its unusual aspect, its large size, and beautifully-pencilled plumage cause it to be regarded as a great attraction for bird watchers. It particularly draws ornithologists to it in attempts to try to spot or photograph it, as it is quite secretive bird, preferring to stay out of sight if at all possible, therefore any sightings or photographs are highly prized. The name Bittern derives from older English "Bittour," "Botor," and "Buttour", cognate with the French Butor, and of is of obscure prior origin. The word Butor seems, however, not to be connected, as Dr. Murray thought, with the medieval Latin Bitorius, for that is generally glossed Wraenna (WREN) or sometimes as "Earthlinger" or "Yrdling." It may actually not signify a bird at all, but a Shrew-Mouse - Araneus, in English a "[W]ranner." Butio seems also to be meant by mediaeval writers in some cases, and a hopeless confusion has been established between that word and Buteo, a Buzzard. Belon's suggestion, made in 1555, connectd Butor with a bird described by Pliny (lib. x. cap. xlii. ), which imitates the lowing of oxen (bourn), and hence was called taurus in the district of Arelate (now Arles), may be correct; for the bird is the Botaurus of some mediaeval writers, and their name is still kept by systematists as that of the genus to which the Bittern belongs. (According to Rolland (Faun. Pop, France, p. 376) it is known in some parts of France as Boeuf d'eau, Taureau d'etang, and other names of similar import). Turner, in 1544, gave as an English synonym "Miredromble"; while "Butter-bump " (corrupted into "Botley-bump") and perhaps other vulgar forms have reference to the booming or bellowing sound for which this species was famous. The old fable of this bird having the habit of inserting its beak into a reed, or plunging it into the ground, and thus causing the booming sound with which its name is associated, has long been exploded, and in modern times very few people in Britain have ever heard its loud (and to the ears of some, quite awful) voice, which seems to be used only in the Spring, this being the bird's breeding season. All the true Bitterns, so far as is known, lay eggs of a light olive-brown colour. The incredulity as to its booming at all has in some quarters succeeded the old belief in this as in other reputed peculiarities of the species. The Bittern is found from Ireland to Japan, in India, and throughout the whole of Africa - providing suitable localities are available. Australia and New Zealand have a kindred species, the Australasian Bittern, Botaurus poiciloptilus, which is said to bellow like a bull. 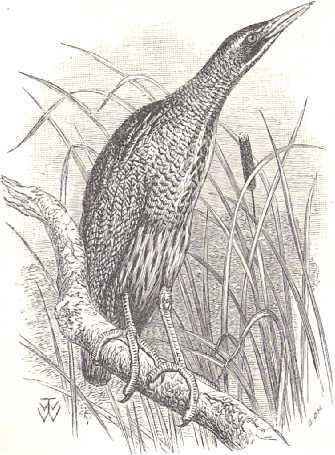 In North America a third species is found, the American Bittern, Botaurus lentiginosa . Richardson, a most accurate observer, positively asserted (Fauna Boreali: Americana, ii. p. 374) that its booming exactly resembles that of its European congener. The American Bittern has several times wandered to Europe, and is distinguishable by its smaller size and uniform greyish-brown primaries, which want the tawny bars that characterize the European Bittern.